The process was easier and less complicated than I thought. Basically, dump a couple jugs of bleach into the well, distribute that bleach-water through the system, let it sit for a day and flush it out. So not too hard, doesn’t take much time to do except for the waiting. It wasn’t even terribly disruptive to live with — basically just missed one shower. There sure are lots of little steps to remember though. Hence this post — it’s turned into quite the fiddly cookbook now that I’ve done it once, but my memory is failing me and this will help the next time. 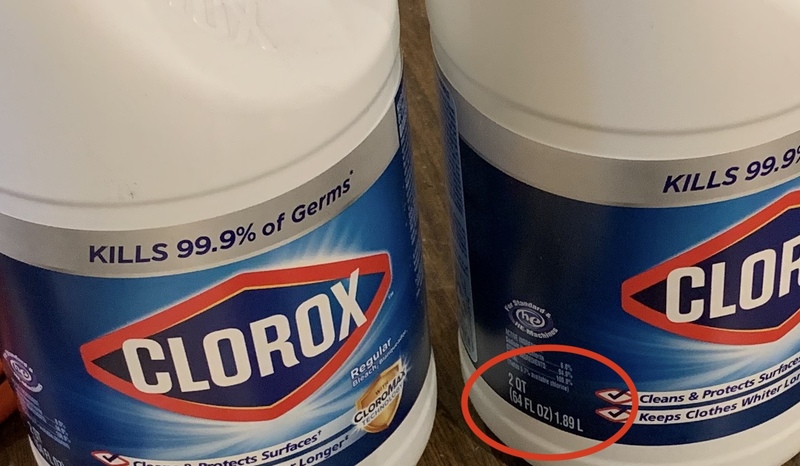 Determine how much bleach to put in the well. We ran 4 quarts of regular bleach through our system. (see the very bottom of this post for how I arrived at that number, and tools you can use to figure out your system). Run water from the house into the well. I used a hose connected to the spigot next to the pump for an hour or so. The goal: mix the bleach into the water and make sure that the treated water is entering the house. Hook up the hose, position it in the well so that it’s below and clear of the electrical connections, gaffer’s tape to hold it in position. Open the hot water taps and let them run until the water gets cold (that’s the clue that chlorinated water is distributed through the hot water pipes/faucets). Let them run for 5 minutes or so and then shut them off. Open the rest of the taps and run them until the water smells like chlorine (shouldn’t be long). Let them run for another 5 minutes or so and then shut them off. We think it’s OK to allow small volumes of chlorinated water into the septic system (toilet flushes, taps) but avoid putting large volumes of water through (showers, etc.) so’s not to kill the bacteria that make the septic system work. Dishwasher? We’re thinking it’s OK to run it with the chlorinated water. The water isn’t THAT chlorinated. Coffeepot? We run one batch of chlorinated water through it and followed up with two rounds using bottled water to flush it out. Plug the water softener back in and run a manual recharge cycle at the same time — that will pull chlorinated water through it for a while, followed by clearer water in the later stages. Turn off the breaker in the hot water heater — partly because draining the heater requires it, and partly because another “is the water cold yet?” test is coming up. Get ready for the next step (draining the chlorinated water out of the hot water heater) by shutting off the water supply — either turn off the pump breaker or shut the valve right after the pump. Open one water tap so that the water heater will drain. Only open one so all the air will go through it and thus you’ll be able to hear when the water heater is pretty much drained (the tap will stop hissing and gurgling). Use the hose to drain the hot water heater out the driveway (rather than running chlorinated water through the septic system). Took about half an hour. When the open tap stops wheezing, most of the water has drained. Don’t need to get every speck, we’re just trying to reduce the amount of chlorinated water going into the septic system. Shut off the water heater drain spigot and remove the hose from the base of the water heater when it’s drained. Fill the hot water heater by leaving that one tap open and turning the water supply back on. Water will start coming out of the open tap when it’s full. Here’s another “is the water cold yet?” test. When the water gets pretty cool, the water in the tank is mostly chlorine-free and it’s time to start flushing all of the rest of the system. Work through the taps in the house. Water will move from room-temperature to cool when the new water arrives. Let each tap run for about 5 minutes after the new water has started coming out. Turn the hot water breaker back on. Plug the water softener back in if you forgot to do that step up above (like I did). Put “crummy stuff” in the first load through the washing machine just in case there’s still some bleach in it. Use a setting that will use both hot and cold water. 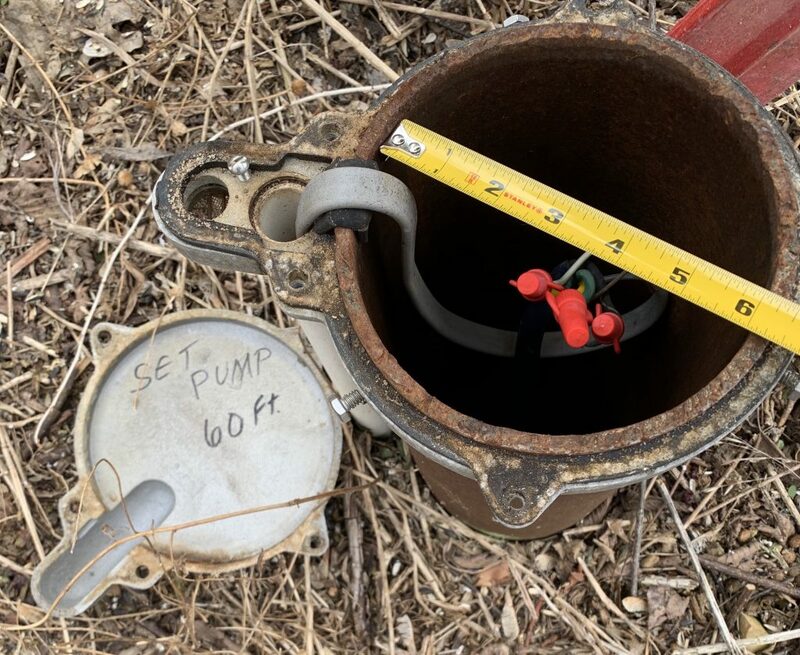 I haven’t measured the depth of the well or the standing water within it, but I’ll make guesses (roughly 100 feet deep, 6″ in diameter and 75 feet of standing water) for now and see if I care about more-precision. I’d measure well-depth with a plumb bob and water-depth with a fishing bobber on a string if I decide I care. But our well is so shallow that it’s not that big a proportion of the total system, so I don’t think I do. Use this table to figure out how much water is in the well casing. Add the amount of water in the hot water heater (100 gallons) and throw in some more for the pressure tank (10 gallons) and some more for good measure to get to an estimate of roughly 250 gallons of water in our system. Use this table to figure out how much bleach to put in. Decide how much bleach to use. Look up the number of gallons of water in the system on the left side of the chart. Decide how concentrated the bleach should be — Wisconsin recommends a range of 100 to 300 parts per million, so pick between those columns. Round up or down if the fractions drive you crazy. Remember, this isn’t brain surgery, nobody gonna die if you get this a little bit off. Here’s an example based on our system which is roughly 250 gallons. If I’d put 5 quarts of bleach in, I’d be at 300 parts/million. I decided to go with 4 quarts of bleach because that meant I could put in two containers of bleach which would put us between between 200-300 parts/million. Close enough for government work.